Occasional on screen text from broadcaster. 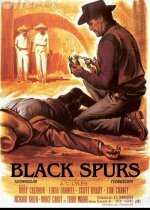 A mercenary is hired to ruin the reputation of his former lover's home town, so that the railroad will be diverted away from it and another settlement will prosper. He hires a band of reprobates to cause mayhem, but their violent methods give him a crisis of conscience and he resolves to protect the town and undo the damage he has caused. Western, starring Rory Calhoun and Linda Darnell.